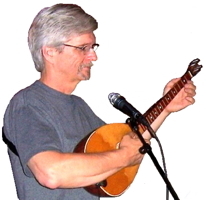 Learn to Play Bulgarian and Macedonian Tambura by Bill Cope. The book provides tablature (not notes), tuning, and strumming pattern for 23 pieces; the tape presents each piece played through slowly, for learning purposes, and then played up to speed with chords and/or harmony. Henry, Folk Arts Center of New England.